As part of the MAGNET software suite from Topcon Positioning, MAGNET Field guarantees to streamline workflow for surveying and engineering professionals. It is a highly graphical and intuitive data collection software system with advanced stake-out functionality, compatibility with different file formats and new ability to calculate and compare land surfaces. 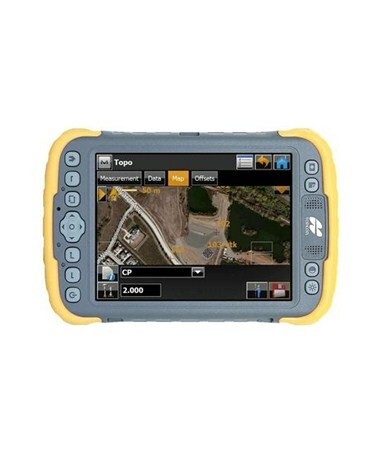 Advanced yet easy to use, it runs on data collectors and total stations to give you full control over land measurements. Get your work done before you return to the office. 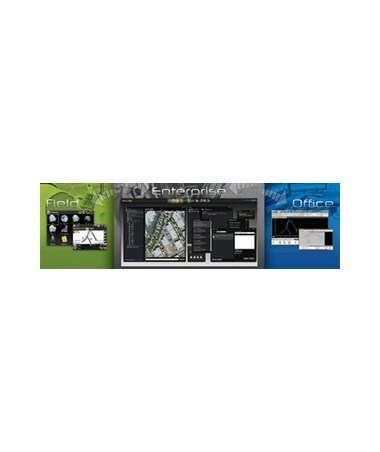 Collaborate with your project managers, field crews, office personnel and engineers in real-time! MAGNET Field software offers the optional ability to log into your company’s Cloud service account via MAGNET Enterprise and process field work at your desktop through MAGNET Office. MAGNET Enterprise is a Cloud service that connects the field and the office so you can effortlessly upload your field work to all other MAGNET company users, enabling them to easily store and access all project data, connect with each other and exchange common office files. Are you an amateur surveyor? No problem! MAGNET Field provides a bright, graphical interface with large icons and clear readable text. The screen on this on-board surveying software not only looks good, but also provides a user-friendly interface that isn't intimidating even for non-professionals. In addition, the icon and text fields have been optimized to provide both images and description of what data should be filled in. This feature is very helpful in guiding new users and decreasing data entry errors. Say goodbye to solving land formulas manually because MAGNET Field includes a set of powerful field applications, such as topo-survey, staking and roads. It also automatically creates digital terrain models (DTM), generates contours and surfaces and calculates volumes in the field. With just a tap on the screen, you can also use Microsoft Bing maps as real-time background images for your field work. This latest Topcon survey software can import and export over 100 file formats via USB or the Cloud and your favorite desktop applications, such as AutoCAD, Autodesk Civil 3D and more. MAGNET Field can be installed on data collectors and total stations running Windows CE.NET 6 or Windows Mobile 6.1 operating system and above. Confidential plans and project data? Sit back and relax. MAGNET Field delivers optional Cloud storage plans through MAGNET Enterprise that are secure and safe with enough room to keep all your data in one location. This field controller software also provides access to an online store with secure credit card transactions, so you can take advantage of every application the MAGNET suite has to offer. You can customize this field data collector software by selecting your desired version from the drop down menu in the upper right hand corner of this page. Add-on modules are also available so you can add features that you might need later on. The MAGNET Field is available in 10 different versions to suit your needs. 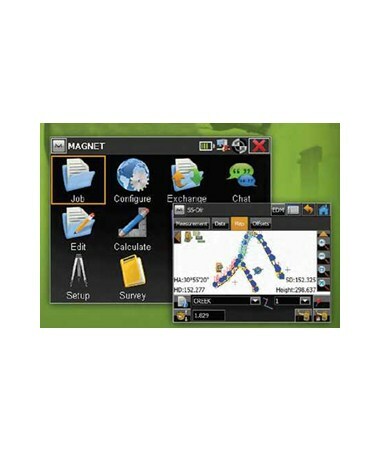 MAGNET Field Basic is the core package of MAGNET software with simplified functionality for common layout tasks and point collection using total stations and handheld data collectors. MAGNET Field does not require an Internet connection in the field but can become even more productive with a cellular modem or Wi-Fi enabled data collector, such as the Topcon Tesla and the FC-2600 Field Controller. MAGNET Field + Roads shares all the MAGNET Field Basic functions and adds advanced roading tool set, including Road Strings, Real-Time Roads and road staking routines. It allows users to create and edit cross-section templates, string sets, horizontal and vertical alignments and more. MAGNET Field does not require an Internet connection in the field but can become even more productive with a cellular modem or Wi-Fi enabled data collector, such as the Topcon Tesla and the FC-2600 Field Controller. MAGNET Field + Robotics shares all the MAGNET Field Basic functions plus enables field users to take control of their existing Topcon robotic instrument. This software version has complete support for all the advanced features of Topcon’s robotic line-up, such as the PS-101A and PS-103A robotic total stations. MAGNET Field does not require an Internet connection in the field but can become even more productive with a cellular modem or Wi-Fi enabled data collector, such as the Topcon Tesla and the FC-2600 Field Controller. MAGNET Field + Roads + Robotics combines all the functions of Basic, Roads and Robotics modules. It enables field users to take control of their existing Topcon robotic instrument, such as the PS-101A and PS-103A robotic total stations, while taking advantage of the advanced roading tool set, including Road Strings, Real-Time Roads and road staking routines. MAGNET Field does not require an Internet connection in the field but can become even more productive with a cellular modem or Wi-Fi enabled data collector, such as the Topcon Tesla and the FC-2600 Field Controller. MAGNET Field + Robotics + GPS combines all the functions of Basic, Robotics and GPS modules. It enables field users to take control of their existing Topcon robotic instrument, such as the PS-101A and PS-103A robotic total stations, while providing complete integration of GPS navigation for precise data collection. MAGNET Field does not require an Internet connection in the field but can become even more productive with a cellular modem or Wi-Fi enabled data collector, such as the Topcon Tesla and the FC-2600 Field Controller. MAGNET Field + GPS with mmGPS shares all the MAGNET Field Basic functions and provides all the advantages of satellite positioning technology with millimeter-level accuracy. MAGNET Field does not require an Internet connection in the field but can become even more productive with a cellular modem or Wi-Fi enabled data collector, such as the Topcon Tesla and the FC-2600 Field Controller. MAGNET Field + Roads + GPS with mmGPS combines all the functions of Basic, Roads and GPS modules. It enables field users to utilize the advanced roading tool set, including Road Strings, Real-Time Roads and road staking routines, while providing all the advantages of satellite positioning technology with millimeter level accuracy. MAGNET Field does not require an Internet connection in the field but can become even more productive with a cellular modem or Wi-Fi enabled data collector, such as the Topcon Tesla and the FC-2600 Field Controller. MAGNET Field + GPS + Optical with mmGPS combines all the functions of Basic and GPS modules and includes communication interfaces for all Topcon optical products. It also provides all the advantages of satellite positioning technology with millimeter precision. MAGNET Field does not require an Internet connection in the field but can become even more productive with a cellular modem or Wi-Fi enabled data collector, such as the Topcon Tesla and the FC-2600 Field Controller. MAGNET Field + Road + GPS + Optical with mmGPS combines all the functions of Basic, Roads and GPS modules and includes communication interfaces for all Topcon optical products. It enables field users to utilize advanced roading tool set, including Road Strings, Real-Time Roads and road staking routines, while providing all the advantages of satellite positioning technology with millimeter-level accuracy. MAGNET Field does not require an Internet connection in the field but can become even more productive with a cellular modem or Wi-Fi enabled data collector, such as the Topcon Tesla and the FC-2600 Field Controller. MAGNET Field Complete with mmGPS is the ultimate field surveying software. It shares all the functions included in the Basic, Roads, Robotics and GPS modules. It completely supports all the advanced features of Topcon’s robotic line-up, such as the PS-101A and PS-103A robotic total stations, utilizes the advanced roading tool set and takes advantage of the satellite positioning technology with millimeter precision. MAGNET Field does not require an Internet connection in the field but can become even more productive with a cellular modem or Wi-Fi enabled data collector, such as the Topcon Tesla and the FC-2600 Field Controller. Only need software for a short period of time? MAGNET Field Solution combines all the functions included in the Basic, Roads, Robotics and GPS modules plus a MAGNET Enterprise login to access Cloud storage for a period of 12 months. It completely supports all the advanced features of Topcon’s robotic line-up, such as the PS-101A and PS-103A robotic total station, utilizes the advanced roading tool set and takes advantage of the satellite positioning technology with millimeter precision. MAGNET Field does not require an Internet connection in the field but can become even more productive with a cellular modem or Wi-Fi enabled data collector, such as the Topcon Tesla and the FC-2600 Field Controller. With over 70 to 100 functions integrated from Topcon’s TopSurv software, MAGNET Field continues Topcon’s legacy in producing a fully integrated software solution that every land surveyor needs. Its field applications along with its optional Cloud storage definitely increase productivity by introducing a direct connection from the field to the office.